A great tourer ready for the its next Adventure. 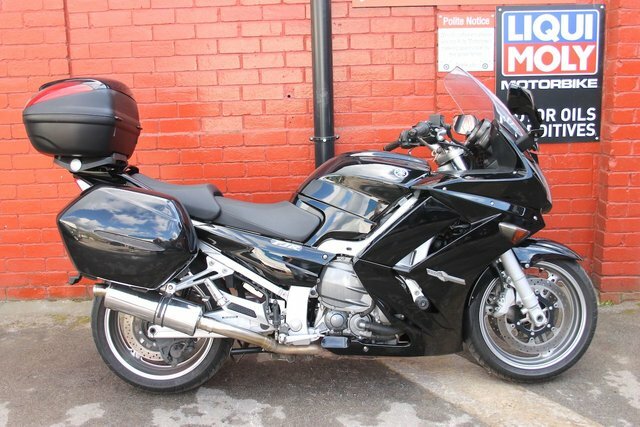 2013 13 YAMAHA FJR 1300 A *12mth MOT, Finance Available, UK Delivery from £100* A great tourer ready for the its next Adventure. Here we have a lovely Yamaha FJR 1300 presented in black with 36K on the clock. FSH and Full luggage. Finance Tailored to your budget. Credit and Debit cards accepted. UK delivery from £100. She will leave us with a full PDI, 12Mth Mot and a 3mth Ride Warranty. Extended nationwide warranties are available at reasonable prices. 8 stamps in the book the last in March 19 at 36148. We have all her keys and booklets. She benefits from Delkevic Cans. heated grips, electric screen and crash bungs. So well kitted out for the next tour. These machines just eat up the miles in comfort and style. Loads of power, great two up and loaded. They are slightly slimmer and lower than the Pan European and Kawasaki GTR. Lovely smooth engine. This bike was silver and has had a professional paint job taking it to black. Ride is a friendly down to earth business with a passion for biking. Finance Available, Nationwide Delivery, HPI Clear, PX Welcome, Friendly Customer Service. 01535 658811. ***Check out our customer reviews on the website, at Ride Motorbikes Ltd Facebook page/Autotrader shop and google*** For more information about us, the bike and our stock please visit our website. The adventure starts here! Open 7 Days A Week. Ask us about Locks and Chains, Datatags, Helmets and Heated Grips. Stay warm and secure with Ride.